If you're the type of concertgoer to get up there on stage to only dive back out on top of your fellow audience members, well, hats off to you. If you've done such antics at a Buffalo Tom show, though, the band wants to talk to you — literally. 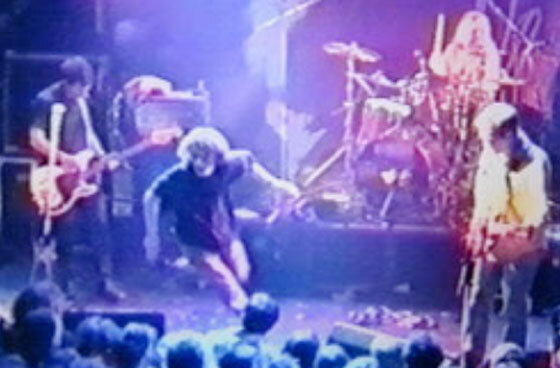 The '90s indie rock heroes have a put a public call out to their fans to find the identities of a series of stagedivers from the group's ULU show in 1992. The hopes are to talk to these divers about their show experience, Buffalo Tom and their lives from then to now. The interviews will then be used as part of an upcoming documentary about Buffalo Tom. You can see a photo of one of the brave divers above, as well as more over here. If you recognize any of the brave souls — or are perhaps one of them — you're asked to contact [email protected] to tell your story. The public callout to divers comes as Buffalo Tom celebrate the reissue of their classic 1992 LP Let Me Come Over, as well as their first-ever live album Buffalo Tom Live From London, ULU, 1992, both of which are out now via Beggars Arkive.